Lichfield Bitcoin & Cryptocurrency Group ~ Inaugural Meetup. 1.5.2018. 7.30pm. Douglas Bakkum at BitBrum [bitbrum.org] 19.11.2017, Birmingham. 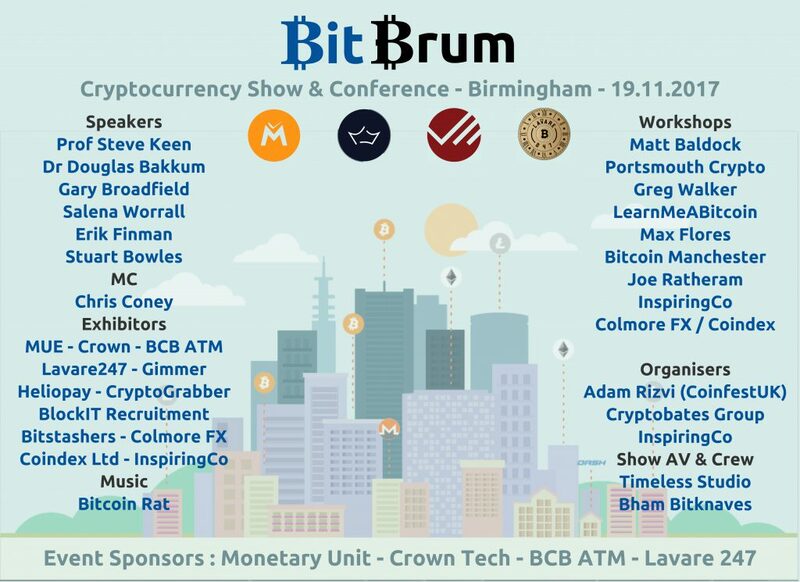 Prof. Steve Keen at BitBrum [bitbrum.org] 19.11.2017, Birmingham. Erik Finman at BitBrum [bitbrum.org] 19.11.2017, Birmingham. Gary Broadfield at BitBrum [bitbrum.org] 19.11.2017, Birmingham. Stuart Bowles at BitBrum [bitbrum.org] 19.11.2017, Birmingham. Salena Worral at BitBrum [bitbrum.org] 19.11.2017, Birmingham. Panel Discussion at BitBrum [bitbrum.org] 19.11.2017, Birmingham.